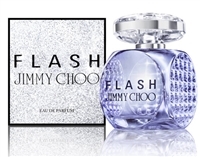 Jimmy CHOO FLASH IS FAR MORE BETTER THAN A LOT OF MY NAME BRAND PERFUMED OR PARFUMS. THIS IS MY FIRST TIME USING AND HAVE FALLING IN LOVE WITH IT. THERE ONE MAYBE, I HAVE THE LARGE SIZE THAT CAME WITH THE SHOWER GEL AND ALSO BODY LOTION. I MADE MY PURCHASE AT ONE OF THE MAJOR STORE, HERE IN ATLANTA, GA. HOWEVER I HAVE NOTICE A SMALL BLACK STRIP ON SEVERAL BOTTLE. SO I WAS WONDERING WHY THE LARGE BOTTLE PURCHASE DON'T HAVE THAT SAME BLACK STRIPE ON MY BOTTLE, THIS WAS NOT AN OUTSIDE SALEE BUT AN INSIDE SALE FROM ONES OF OUR MAJOR STORES.